09 | February | 2012 | E-verything! Apologies all for very tardy posting! As usual the return to work after our long summer break meant a frenetic few days before returning and subsequently 2 weeks where I have felt more and more overwhelmed by the number of things I need to do. We followed our usual format of putting our topic ideas on the whiteboard and then polling to choose the subject for discussion. The winner was a combined topic around “All teachers should blog” and How much private info/thoughs should we reveal on a professional blog. We started with a whiteboard although, as is often the case when we are a small group who all have audio, the discussion was quite audio based. Discussion ranged around the pros of blogging for teachers, should it be compulsory as part of professional development and some privacy thoughts. This session illustrated to me that sometimes you just can’t be sufficiently prepared for contingencies. During the session we had a major thunderstorm and I lost power. I had anticipated the possiblity and was also in the room as a moderator via laptop and wireless modem. However the strike that put the main power off also temporarily knocked out the wireless modem and thus kicked me out of the BbC room. Luckily the participants (all very experienced users) just carried on. In retrospect I probably should have made someone else moderator as well! The second webinar in this post was an Edublogs Fine Focus – Do you Toon? As always this was recorded. This topic happened because I have cartoons and animations on my mind at the moment. One of the mini-projects that I will be using with students in my National VET E-learning (NVELS) project “E-xtraordinary Learning For A Digital Age” (ELFADA) is for the students to explore some video and cartoon texts and then make their own and embed them in their blogs, so I am exploring the tools available so that I can focus on the easiest to use. It seemed a good opportunity for one of our occasional explore and share sessions. activity was a look at whether we knew any of the tools. Then we followed a similar pattern to previous tool exploration sessions. Everyone chose a tool to explore from Go! 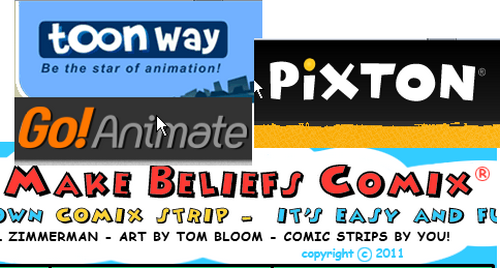 Animate, Make Beliefs Comix, Pixton and Toon Way. Having decided which tool to explore the group dispersed for ten minutes to explore their chosen tools. Then we reconvened to share ideas on: ease of learning the basics; how engaging to use; possible lessons/contexts; whether we would use with students. These sessions are always both fun and informative! Exploring something new in a short time frame is always challenging but is authentic in terms of potential use with students. Students need to be able to grasp the basics of a tool quickly because it is a tool and not the primary learning objective of the activity. In my context, with often disengaged and/or not very ICT literate students, I find that tools have to be both quick and easy to learn in order to engage students and enable them to develop their “text” (visual, oral and written) creation skills. Reaching the end of the marathon post with this recorded Serendipity session. This is an issue close to all of us who teach in any context. Teaching itself is demanding enough with the need to meet individual student needs across many levels, learning preferences and personal interests. Add the demands of curriculum and standardised testing or excessive audit requirements, and the increasingly heavy administrative load (this latter often the result of a requirement to justify almost every one of the myriad professional decisions we make each day) and it is unsurprising that the majority of good and conscientious “teachers” feel overwhelmed! As always we started with ideas for the discussion topic of the week, and then moved on to vote on these. Perhaps predictably “Strategies for overwhelemed teachers” was the absolute winner. Certainly as one who has just returned to my role as a lecturer in public vocational education at the start of a new academic year in Australia I already feel overwhelmed, and for colleagues in the northern hemisphere that return to teaching after the Christmas holiday in the darkest, coldest time of the year can (as I well remember) be soul destroying in itself. 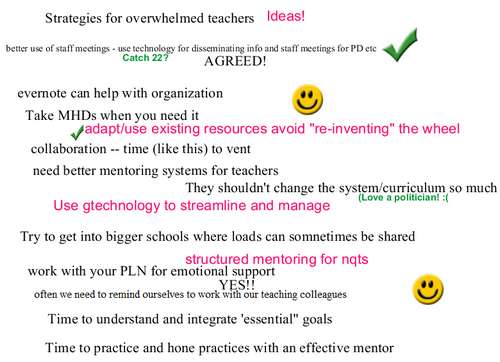 We decided to take a brief look at what it was that made us feel overwhelmed – inevitably the main culprits are those things we have to do that don’t directly relate to teaching eg admin/paperwork and also the ever moving “goalposts” imposed from outside. Then we moved on to look at the strategies for dealing with these. Between us we actually had two whiteboards of ideas – one is shown above. As always the discussion and sharing was not limited to the whiteboard and there were also many textchat and audio contributions to our thoughts making this a session where it is well worth catching the recording. One of the most significant things that several of us took away at the end of the session was the awareness that we all have the same issues wherever we are in the world. 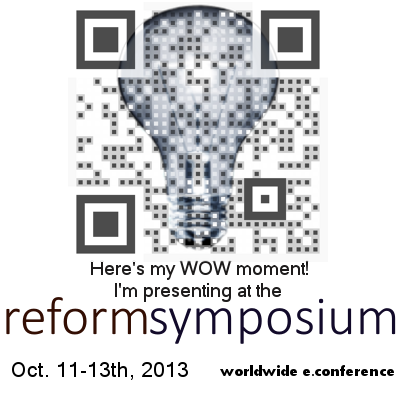 I think this session will resonate with teachers everywhere! I certainly found it helped me with my current sense of being overwhelmed. In common with others I find/have found that my global PLN has been a phenomenal support for me in helping me to survive and manage all those pressures that overwhelm me. Often the the support comes in practical help, advice and suggestions. Sometimes it is just that with a global PLN there is someone I can connect with and chat to via Twitter in that “dark night of the soul” when once again I am up at 3am working because the “overwhelmedness” is preventing me from sleeping! Our next Webinar is an Edublogs “Fine Focus” session. This will be a fantastic session with Sue Wyatt (@tasteach) who will tell us about (and invite you and your students to take part in) the Global Student Blogging Challenge that she has now been running twice a year for the last few years. Join us on Thursday February 9th at 23:00 GMT/UTC the time for you will vary depending on your timezone (check yours here) Thursday afternoon/evening in the USA, late night Thursday in Europe, and Friday morning February 10th in Australia – in the usual Blackboard Collaborate virtual room.